This is one of the easiest and quickest things you can do to promote your Facebook page – Put a Facebook Like Box on your website! 1. Go HERE. You are now on a page in Facebook where you can create your box. 2. 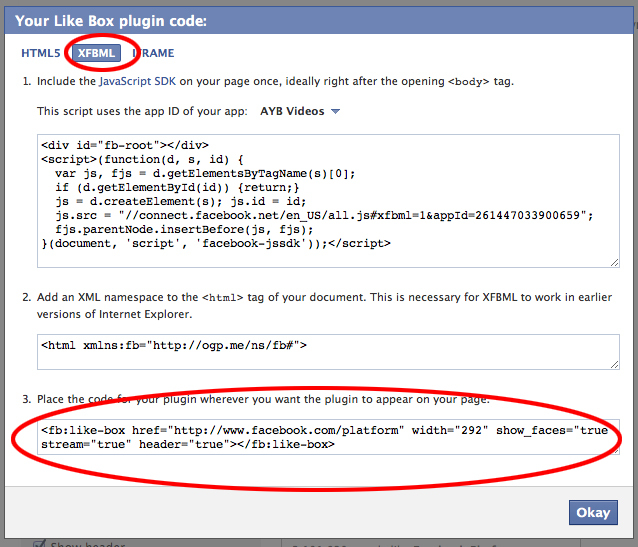 In “ Facebook Page URL” you will enter the exact url of your Facebook page. Make sure to include http:// in front. 3. 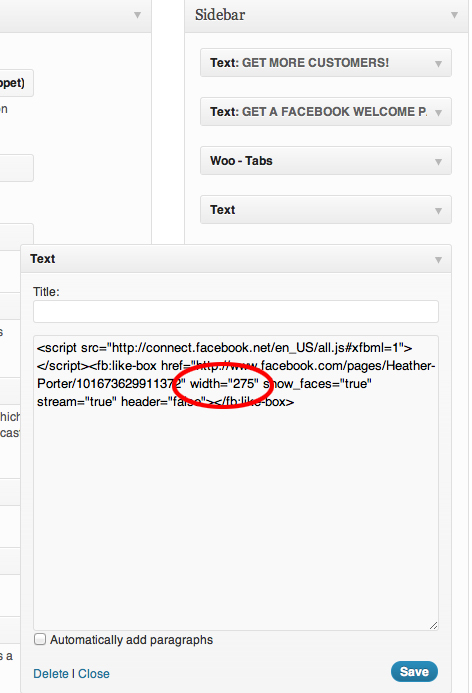 For width a good standard Facebook width to use that fits in most WordPress side bars is 275. You can change this later. 4. I like to keep the color scheme on “light” and check the box for “show faces” – both are the default settings. 5. Also, I recommend checking the boxes by “show stream” and “show header”. This will allow people to like your page from within your site and also see your newest posts. 6. Then click on “Get Code”. 8. First you click on “xfbml” at the top then you copy the code from the box circled in red. 9. Log into the backend (wp-admin) of your website and find “appearance” then click on “widgets” in the left menu. 10. Once in there create a new “text” widget by clicking on and then dragging the box that says “text” from your widget choices and moving it into the position you want in the side bar of your blog. (see below). 11. Then paste in the code you got from Step 7 above (see below). 12. Once you paste in the code click “save” and then see how it looks on your site. If you are not happy with the width you can change it by finding the “width=____” as shown in the red circle below. Choose the width you would like to try. Try increasing it by 10 pixel increments. All you would do here is replace the 275 with a 285. Make sure and click save. 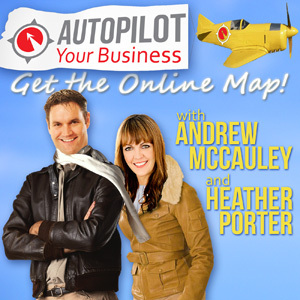 You have just learned one easy step on how to promote your Facebook Page! 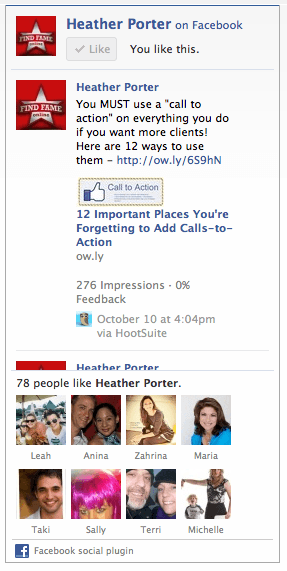 Check out your new Facebook Like Box on your site and get ready to enjoy the extra exposure!